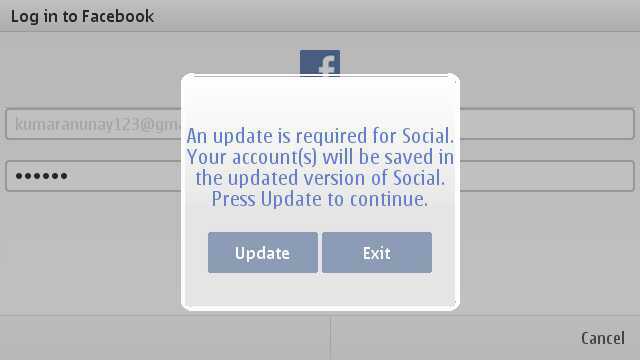 The Social Networks application for Nokia N8 has been updated to version 1.2.157. The update does not add any more functionality to the application. However, there are a few GUI tweaks like your profile picture now gets displayed on the app on an all time basis for Facebook. The scrolling of the updates inside the application is smoother. The performance of the application is a lot better than it was earlier. You see the images getting loaded faster and updates being visible quickly. Earlier, I had experienced a lot of issues with the application even on a Wifi connection. Talking about Twitter, I see a lot of enhancements with the ability to upload and share pictures via TwitPic. The upload is quick and good. You see the uploaded picture's link with a description immediately after the upload as one of your latest tweets. As far as Facebook is concerned, you can upload pictures which are Geo-tagged with your current location. I sincerely hope that this application adds more social networks to its kitty as time goes by. Some of these may include MySpace, Orkut, LinkedIn, Hi5, etc. However, it is surely good start with Twitter and Facebook as these social networks are the widely used ones on the planet today. 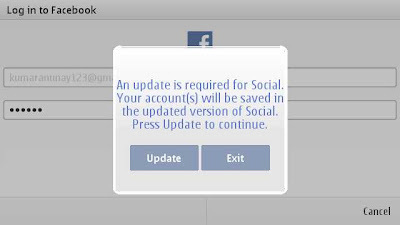 The application takes you to the update site as soon as you try to log into the application on your phone. The size of the update is 2.3 MB.